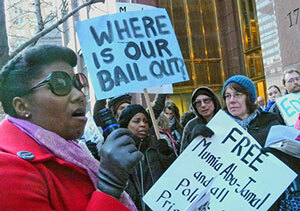 Jamila Wilson addresses Feb. 20 rally. Organized by DecarceratePA and endorsed by Occupy Philadelphia, the protest targeted the disparity between increased funding for prison construction while Pennsylvania Gov. Tom Corbett slashes funding for education and is pushing for more cuts. Heery, which profits from private prison construction, was paid $316 million in October to build a Graterford Prison extension to house 4,100 more inmates and a new death row facility.